Here in New England, we’re in the midst of a blizzard, and I’m going through old files, where I found the following. About a dozen years ago, I was teaching a literature and writing class for homeschoolers, and we read Jonathan Swift’s “A Modest Proposal.” The students were invited to try their hand at satire and write modest proposals of their own. 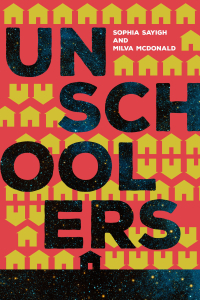 I wrote one, too, poking fun at many of the trends and issues I was seeing in the homeschooling movement at the time. Reading it all these years later, and with a few tweaks, it still feels relevant. Here it is, dear readers, in hopes that it provides food for thought, and maybe even a few laughs. It is a wonderful thing to see the citizens of our great nation exercising their rights to life, liberty, and the pursuit of happiness. It is heartening to see them partake of the freedoms upon which our United States were founded. Every so often, however, people go too far. There is no better example of this than homeschooling. To see families eschew one of the most generous offers granted to our citizenry, that of a free, equal education for all, is both fascinating and astonishing. Today, at the start of the 21st century, we do not know exactly how many of these misguided adventurers exist. Some estimate upwards of a million. Others believe there are closer to three million. What we know for certain is that the number of homeschoolers is growing exponentially. The clip at which idealistic parents are jumping onto this bandwagon is staggering. As precious as it is to let freedom ring, it is quite clear we can no longer allow these people free rein. Most of our citizens have evolved into the docile, accepting folk needed to maintain America’s status. It remains only for these lucky souls to graze continually in an ever-predictable existence with no decision-making burdens beyond what to buy. We have filled their pastures with plenty, and truly, they are blessed. Natural human qualities such as curiosity, ingenuity, and the desire for independence have been subdued. To the extent that they still exist, they are used productively, directed toward television, social media, football, and above all, consumerism. That a few people would insanely choose a lifestyle different from the norm was inevitable. That these few be allowed to create a backlash which has the potential to pull otherwise sensible people into their hare-brained scheme is unacceptable. Undoubtedly, homeschoolers will never succeed in toppling the compulsory education system, the genius of which lies in the fact that it will perpetuate itself and fulfill its mission indefinitely. But as benevolent rulers interested in the welfare of our population it is our responsibility to eradicate this trend. We must not allow these anarchists to lure others onto their fruitless path. I do not suggest we withdraw freedoms. That would be blasphemy, and entirely in contradiction with the good, true, and right principles we consistently practice. I also do not suggest that our current methods of control are ineffective. Surely, monitoring and regulations serve quite well to prevent total chaos, and assure that these children do not become complete pariahs. Indeed, this is our responsibility, and my proposal does not involve abandoning any of our current tactics, although I do not advocate the intimidation and harassment embraced by foolhardy public school officials in love with their own utopian vision and fantasies of power and authority (see my other modest proposal for uppity bureaucrats). Rather, I suggest we guide these puppets to embrace an alternate view, one that applauds the knuckle-headed decision of homeschoolers to do it themselves. We must admire their courage. We must praise their independence. We must invite them to use our schools whenever they would like. This proposal presents no danger of them spreading their disease to the institutionalized masses. Quite the opposite. With their noses in our strategically created educational materials, they will instead be cured, and the beauty is one which we know well: they will not even realize it has happened. Homeschoolers will happily take the bait of my proposal and be fully compliant citizens, as well schooled as those public schoolers they disdain, while maintaining the inner illusion that they have broken free of the system. Our appointed officials must be encouraged to provide homeschoolers with resources, and know that helping homeschoolers is an honorable goal they are duty bound to pursue. Any amount of time homeschooled children can be pulled into the system, either by using our materials or attending classes or receiving public monies, is a chance for indoctrination. All children deserve to have that chance. The more resources we can provide to homeschoolers, the less self-sufficiency they will develop, and the greater their opportunities for growing into dutiful, dependent Americans. Challenges? Not many. We face meager opposition from annoying organizations such as teachers unions, who see homeschoolers as a threat to their livelihood and would rather harass than help them. Their narrow view does not allow them to see the big picture, but then again, the big picture is only ours to see. One delightful aspect of this problem is that homeschoolers themselves are coming to our aid. The divisiveness within their ranks is severe, and unsurprising given their propensity toward free thinking. Fortunately, the majority has been trained well enough to remain complacent and smug and for the most part in the dark about larger machinations. More and more of them greedily take the bait we offer, snapping it up like dogs to a bone. Some have even given in to their better capitalistic instincts by creating learning and resource centers, which they actively market to fellow homeschoolers, especially new ones, depriving them of the opportunity to create their own learning experiences. These newfangled institutions market unorthodox methods, but their offerings are nothing we haven’t seen and dealt with in prior decades, and at least they serve to keep their patrons’ cash circulating in the market economy. It is heartening to see that while these individuals have strayed from their better judgment in some ways, at the core they have absorbed the important lessons, and still understand the flexibility and choice which succumbing to consumerism offers. Even more impressive are the numbers of homeschoolers the Christian right has brought on board, particularly in the area of legal matters. Clever people they are, dispensing propaganda that plays directly into homeschoolers’ natural fear of our authority. These enterprising folks have managed to breed a hysterical paranoia, convincing homeschoolers who don’t even subscribe to their religious philosophies that we are after them with a vengeance, and that a small financial investment offers the security they crave. Homeschoolers can’t seem to fork it over quickly enough, contributing blissfully, substantially, and obliviously to their own disempowerment. Which, of course, leaves them ripe for grabbing the carrots we dangle before them, and now, my friends, I come to the crux of my proposal. It is time to go beyond friendly support as bait to return homeschoolers to the system. Technological advances allow us to employ far more effective means. We can let them stay at home and enroll them in the system all at the same time. We offer them free curriculum, free supplies, free computers, and free experts to keep an eye on them. They continue to be “homeschoolers” while absorbing all the important lessons about following directions, knowing their place, looking to authorities to tell them what to think, and the like. I am sure that by now you see the brilliance of my proposal, which allows us to brainwash those who foolishly choose to homeschool. We must not doubt that renegade individuals such as homeschoolers are brainwashable. Geniuses such as George Orwell and B.F. Skinner have clearly shown us otherwise. Orwell’s failing was his inability to see the kindness this extends to the human race, and the imperative of conditioning for the greater good. This is our mandate, our responsibility, and our most noble and moral purpose. Hahahahahahahahah! I am in awe of your genius! Oh, I forgot to say: SIGN ME UP!!! !